The perfect balance between clean and healthy. The MAXX is in a category by itself and our absolute top recommendation. pH and ORP levels like the best electric ionizers, but with filtration capability that blows them away. There is no better way to enjoy alkaline water...unless you're drinking from a glacier. Reverse osmosis (RO) systems do an outstanding job eliminating a wide range of toxins, as you can see from the at the bottom of the page. Unfortunately, they are not discriminating and strip the good with the bad. We're then left with a super clean water, but a water that is acidic, dead and biologically damaging. Just because it's clean, doesn't mean it's healthy. 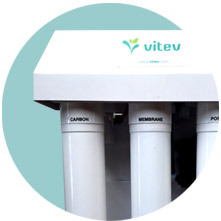 The MAXX uses RO for its filtration basis, but then adds our healthy Vitev Mix to the water. By using a specially designed cartridge with slow release minerals and ceramics (no worries about kidney stones or overdosing) we are able to create a water with high pH levels, ionized antioxidant benefits and the same light, super hydrating properties previously found only with electric water ionizers. RO systems are infamous for how much water they waste. It’s one of the trade offs typically made in order to eliminate the high amounts of the toxins and not really something we could control. If one wanted less waste, than they had to choose less filtration. The MAXX incorporates Vitev's new Water Optimizer which saves up to 80% more water than other RO systems. Less waste and lower water bills. Now you can have your filtration and drink it too. Take a look at this video for more info. Another consideration RO uses have traditionally had to deal with is waiting for water. Because the filtration restriction is so fine, it takes a significant amount of time to produce the clean, drinkable water. Just like with waste, if you wanted more water quicker, you had to choose less filtration. The Water Optimizer eliminates the delay which means our tank fills up to 4 times faster than other ROs. Clean, efficient and now without the wait. Hard water is to RO systems what Kryptonite is to Superman. It can decrease performance, clogs filters and turn your RO system into a huge headache. For both of us. With Vitev's new optional Scale Guard, hard water problems are a thing of the past. We've worked with a company who specializes in the protection of large commercial chillers, steamers and other very expensive and sensitive equipment. They've personalized their proprietary solution and made it fit conveniently under your sink. So if you don't have a whole-home softener, and especially if you live in areas known for hard water (So Cal, desert southwest, and the plains/upper midwest) the Scale Guard is for you. It doesn’t matter how good you feel or how flexible you are, working under the kitchen sink is not fun. Tight, cluttered spaces can make replacing RO filters a series of curse words, scraped knuckles and bumps on the back of the head. Which is why a lot of people pay plumbers for regular maintenance. The MAXX incorporates a simple twist off feature, which means if you can unscrew a light bulb, you can replace a filter in just a few seconds. Same time, save money and most importantly, save a few bumps and bruises. Installation questions? Check out our manual and the "box top" video below. ** These are eliminated by the MAXX before the Mineral cartridge and an illustration of why we need to add minerals back into the water!